In a previous post I had replaced a Netduino and Elecfreaks Joystick shield based remote control with a MikrobusNet Quail, thumbstick click and an nRF-C click. The next step was to replace the Netduino on the robot chassis with a MikrobusNet Quail, a pair of DC Motor Clicks and an nRF-C click. 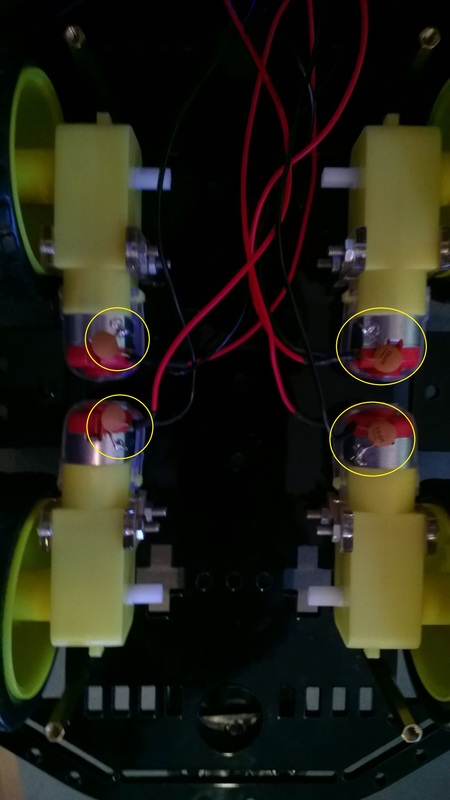 The first version of the robot uses a pair of battery packs one for the motors the other for the Quail board. The drivers developed by MikroBUSNet team greatly reduced the amount of code I had to write to get the robot to work. I have kept the communications monitoring functionality which stops the motors when the robot gets out of range of the remote control software fails. 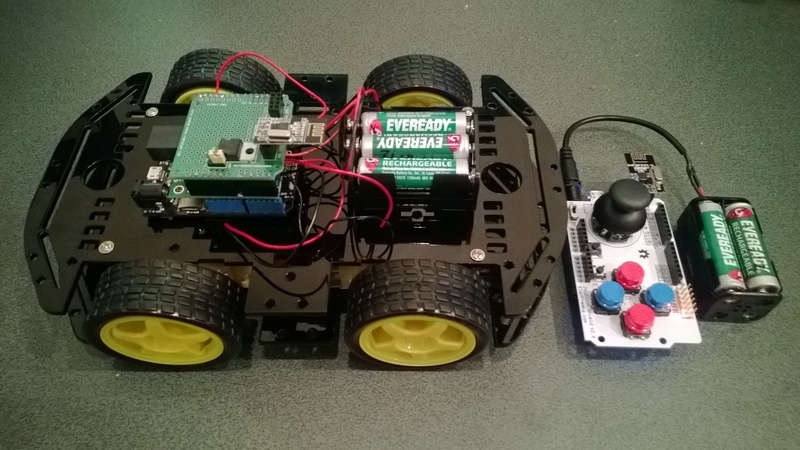 In a previous pair of posts (part1 & part2) in February 2014 I built a 4WD Robot and remote control using a pair of Netduinos, an elecfreaks Smart Car Chassis 4WD, an elecfreaks joystick 2.4, an Embedded coolness nRF24Lo1 shield and a Pololu MC33926 motor shield. My Quail device looked like a good platform for building a handheld control with a different form factor. The Quail device and battery pack aren’t quite small enough to work with one hand. A Mikrobus.Net Dalmatian or Tuatara based remote might be easier to use. I tried using the thumbstick button pushed message for the horn functionality but it made the throttle and heading jump. The Mikrobus.Net team have done a great job with the number and quality of the drivers for the Mikroe click boards. The Mikroe click boards are individually packaged with professionally written click specific and handling instructions. I finally had some time to finish off the 4WD robot I first blogged about in February this year. When I fired up the robot the nrf24L01 module on the embedded coolness shield was having some problems with electrical noise from the motors. This noise was causing the wireless module to report errors then stop working. So, based on this article by Pololu I added some noise suppression capacitors. There are two 0.1uF capacitors per motor and they connect the power supply pins to the metal casing of the motor. I have also twisted the motor supply wires and added some capacitors to the motor shield. The Elecfreaks Joystick has to be modified to work with a Netduino. The remote control uses the initial position of the joystick for a calibration offset then sends 4 byte commands to the robot every 250mSec. The first two bytes are the motor directions and the last two are the motor speeds. 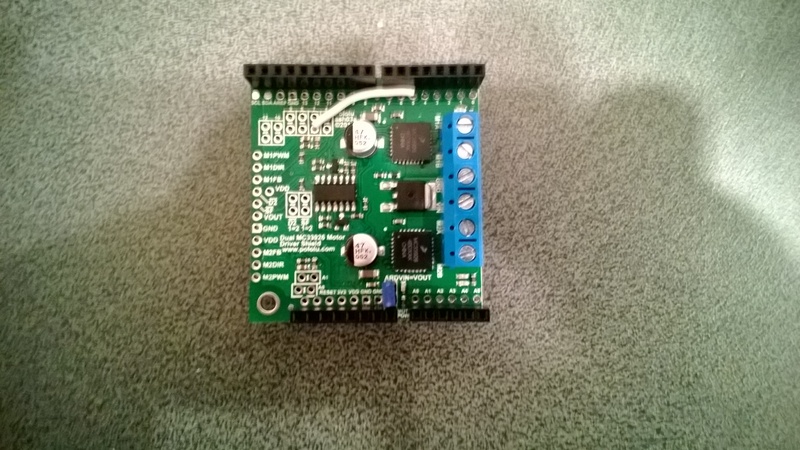 After trialling the robot round the house I added a timer to shut the motors down if connectivity was lost. Before adding the noise suppression capacitors I managed to plough the robot into the wall when the radio link failed and the motors were running at close to full speed. A couple of parcels of parts arrived last week and I have started assembling my next robot project (possibly for code club). 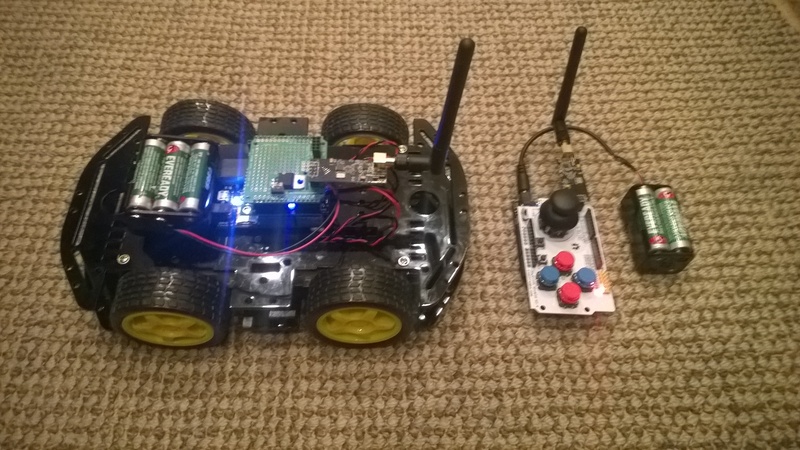 It’s a 4WD drive robot with an nRF24L01+ based remote control. Had a slight problem with pin usage, the Embedded Coolness nRF24L01 shield and Pololu Dual MC33926 Motor Shield both use pin D2(irq) & D7(csn). The polulu shield supports some customising of pins so I disconnected D2(Status flag indicator), cut the D7 link (Motor 1 direction input) and wired it to pin D5. A fortnight ago I purchased two shields from Embedded Coolness for a couple of nRF24L01 based projects (quadcopter & robot control system) I’m working on.The shields were very reasonably priced and took roughly 10-15 minutes each to assemble. Though intended for Arduino based projects the hardware SPI port works with the Nordic nRF24L01 .Net Micro Framework Driver on Codeplex. 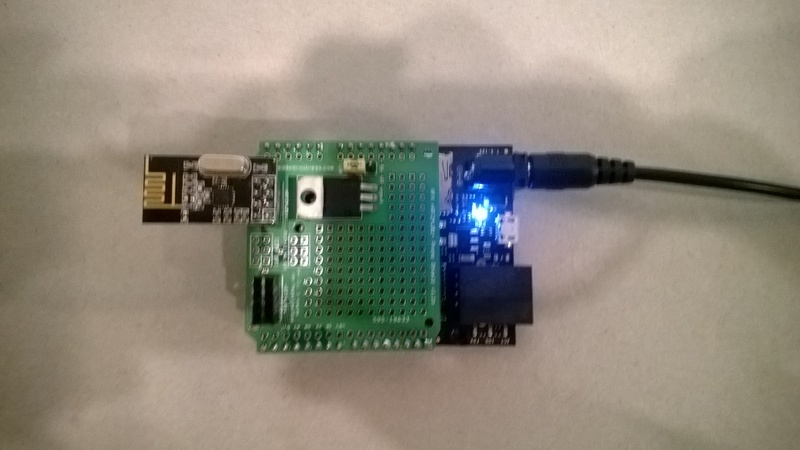 I adapted the sample application included with the Nordic nRF24L01 .Net Micro Framework Driver source from codeplex to give a minimal working Netduino example.